The BMW M62 is a naturally aspirated V8 petrol engine which was produced from 1995 to 2005. A successor to the BMW M60, the M62 features an aluminium engine block and a single row timing chain. In 1998, a Technical Update included VANOS (variable valve timing) for the intake camshafts. 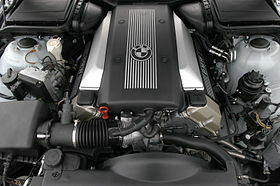 The S62 engine is the BMW M high performance version of the M62, which was released in the E39 M5. Like the BMW M60 engine it replaced, the M62 is a DOHC engine with four valves per cylinder, an aluminium block and aluminium heads. The M62 has fracture-split forged connecting rods, hypereutectic pistons with ferrous coated side skirts. Most of the M62 engines used Alusil for the block material, however some early M62 engines used Nikasil cylinder coating instead. Alusil is a technology which incorporates a percentage of silicon integrated throughout the aluminum cast, therefore liners, or treated bores are not needed within this block family. The M62 uses a Bosch Motronic 5.2 engine control unit (also called "DME") and a hot wire MAF. In 1998, a "Technical Update" was applied to the M62, resulting in the M62TU variants. New features include single-VANOS (variable valve timing for the intake camshaft) and electronic throttle control. The engine management was updated to Motronic ME7.2. Figures specified are for European models. * 175 kW (235 bhp) for E38 7 Series models. The M62B35 has a bore of 84 mm (3.3 in) and a stroke of 78.9 mm (3.1 in). In 1998, the Technical Update was applied, resulting in the M62TUB35. Versions used in the E39 5 Series application have slightly more power than versions used in the E38 7 Series. The M62B44 has a bore of 92 mm (3.6 in) and a stroke of 82.7 mm (3.26 in). The M62B46 was developed by Alpina, and was designated the F3, based on the M62B44. It has a bore of 93 mm (3.7 in) and a stroke of 85 mm (3.3 in). In 1998, the Technical Update was applied, resulting in the M62TUB44. In the United States, power for 2001-2003 540i models was increased to 216 kW (290 bhp). The M62TUB46 is based on the M62TUB44. Featureing a 10.5mm lift intake and exhaust camshaft. Slightly stronger valve springs and valves. It has a bore of 93 mm (3.7 in) and a stroke of 85 mm (3.3 in). The M62B48 was developed by Alpina, based on the M62TUB44. It has a bore of 93 mm (3.7 in) and a stroke of 89 mm (3.5 in). The BMW S62 engine (full model code S62B50) is the high-performance variant of the M62, which is fitted to the E39 M5 and the E52 Z8. The S62 was BMW's first V8 engine to have double-VANOS (variable valve timing on the intake and exhaust camshafts). The S62 engine produces 294 kW (394 hp) at 6600 rpm and 500 N⋅m (369 lb⋅ft) at 3800 rpm. The redline is 7000 rpm. The bore and stroke are 94 mm (3.7 in) and 89 mm (3.5 in) respectively. This results in a displacement of 4,941 cc (301.5 cu in), compared with the 4,398 cc (268.4 cu in) of the largest M62 engine at the time. Individual throttle bodies for each of the eight cylinders, which are electronically actuated and have driver-selectable "normal" and "sport" mode throttle response. As per the M62, the S62 has an aluminium block and head. The S62 was assembled at BMW's Dingolfing plant. The 1998-2000 Bentley Arnage (Green Label) is powered by a Cosworth-developed twin-turbo version of the M62B44. This engine produces 260 kW (349 bhp) and 569 N⋅m (420 lb⋅ft). ^ "BMW 8-Zylinder Motor (M62)". bmw-grouparchiv.de. Retrieved 19 June 2017. ^ "BMW World - Nikasil". www.usautoparts.net. Archived from the original on 12 August 2014. 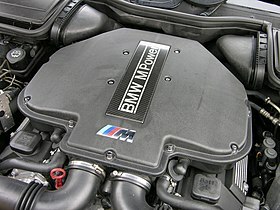 ^ a b c "BMW M62 engine". www.usautoparts.net. Archived from the original on 2 November 2013. ^ "BMW M62 Engine". www.bmwpower.co.za. Archived from the original on 2014-03-05. ^ "BMW M60 and M62 V8 Engines". www.unixnerd.demon.co.uk. Retrieved 24 June 2017. 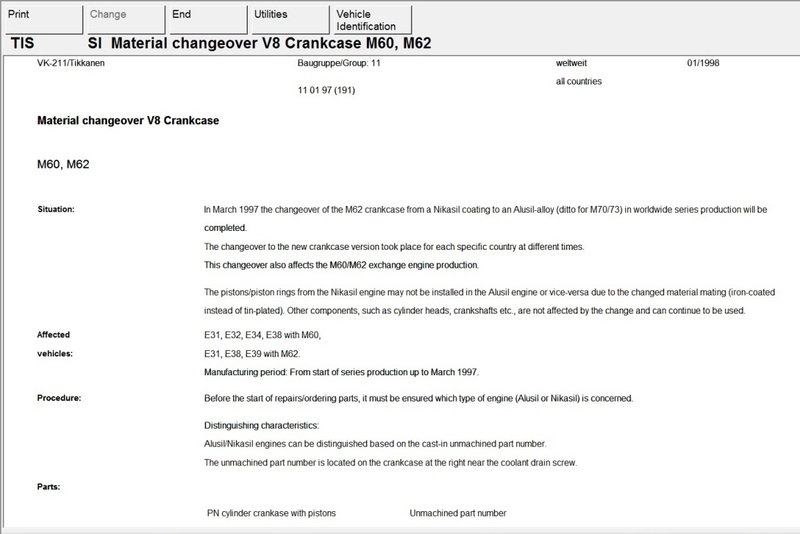 ^ "Material changeover V8 crankcase M60, M62- p1". www.bmw-planet.com. Archived from the original on 2016-03-03. 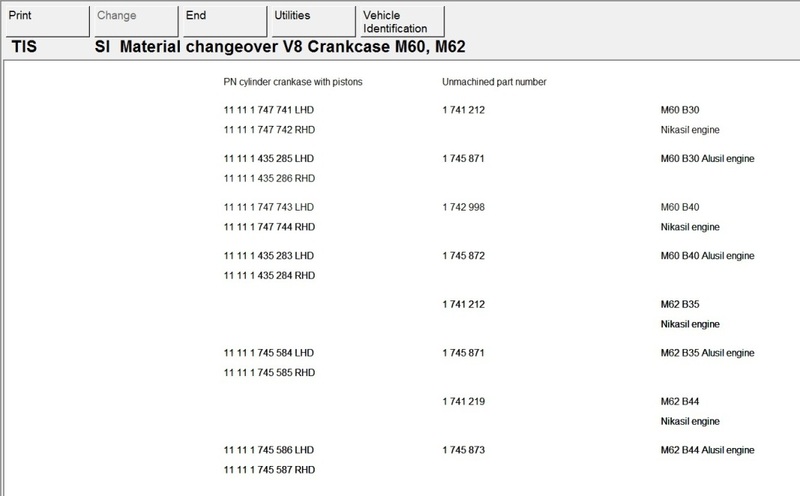 ^ "Material changeover V8 crankcase M60, M62- p2". www.bmw-planet.com. Archived from the original on 2016-03-03. ^ "BMW M60 M62 and M62TU Engine". www.meeknet.co.uk. Retrieved 21 June 2017. ^ "E30 BMW M62/M60 V8 Swap". www.rtsauto.com. Retrieved 25 August 2012. ^ M62TU Training Manual (PDF). BMW AG. p. 15. Retrieved 21 June 2017. ^ "BMW M62B44/M62TUB44 Engine". www.mywikimotors.com. Retrieved 21 June 2017. ^ Brochure for 5 Series (in German). BMW AG. 1998. p. 40. Retrieved 6 April 2017. ^ Operating manual for 5 Series. BMW AG. July 1998. p. 212. Retrieved 6 April 2017. ^ Brochure for 5 Series. BMW AG. 2003. p. 18. Retrieved 7 April 2017. ^ Brochure for X5 (in German). BMW AG. 2001. p. 46. Retrieved 10 April 2017. ^ "ALPINA Automobiles based on BMW 5 Series E39". www.alpina-automobiles.com. Retrieved 10 April 2017. ^ "20 Jahre BMW Alpina B10 V8 E39: Jubiläum in Buchloe". BimmerToday Deutschland. 31 January 2017. Retrieved 26 February 2019. ^ a b c d e f "Engine specifications for M62 engines". www.bmwheaven.com. Retrieved 2012-08-25. ^ "BMW 5 Series E39: ALPINA Automobiles". www.alpina-automobiles.com. Retrieved 26 February 2019. ^ "540i 6-speed sedan Technical Data". www.bmwusa.com. Archived from the original on 18 December 2001. ^ "BMW 540i (2003) full detailed specifications listing". www.automobile-catalog.com. Retrieved 22 June 2017. ^ "2004 Morgan Aero 8 GTN for sale". www.finecars.cc. Retrieved 21 June 2017. ^ "2003 Alpina B10 V8 S Switch-Tronic specifications & performance data review". www.automobile-catalog.com. Retrieved 21 June 2017. ^ a b c d "BMW S62 Engine". www.usautoparts.net. Archived from the original on 16 June 2012. ^ "Engine specifications for Motorsport engines". www.bmwheaven.com. Retrieved 25 August 2012. ^ "Coming to America: The BMW M5". www.roadandtrack.com. Retrieved 15 June 2017. ^ "BMW History: E39 M5". www.bmwblog.com. Retrieved 24 June 2017. ^ a b "BMW E39 M5". www.bmwmcars.net. Archived from the original on 10 September 2012. ^ "25 years of the BMW M5". www.evo.co.uk. Retrieved 25 August 2012. ^ "FAQ E39 M5". www.bmwmregistry.com. Retrieved 24 June 2017. ^ "BMW S62 Engine". www.mywikimotors.com. Retrieved 24 June 2017. ^ "Engine Guide BMW S62". drive-my.com. Retrieved 24 June 2017. ^ "BMW M62/S62". www.bmw-tech.org. Retrieved 24 June 2017. ^ "BMW S62 engine". www.v8engine.co.za. Retrieved 24 June 2017. ^ "2000 Bentley Arnage". www.motortrend.com. Retrieved 9 August 2017. ^ "History of the Bentley Arnage". www.nfcperformance.com. Retrieved 9 August 2017. This page was last edited on 11 March 2019, at 08:34 (UTC).